Hard for me to believe, but my first trip to the Grand Canyon (a four and a half hour drive from my home in Phoenix) wasn't until the spring of 1988, six years after moving to Arizona. It was just me and Cindy and we basically just stopped at the various outlooks. It was very cold Memorial Day weekend. How cold? We had snow flurries! A few weekends later we returned with Cindy's brother (Bobby) and sister (Susan) to much better weather. One of the stops we made this time was at the top of South Kaibab Trail near Yaki Point. This is one of two major trails leading down the canyon to the Colorado River. At the bottom is an overnight resting place called Phantom Ranch. These are the famous trails where you can take a mule ride down and up as long as you get reservations about a year (yes, I understand it's 2 full years) in advance. The one-night stay at Phantom Ranch is included in the mule trip which makes it a two-day activity. But the mule trip is not a prerequisite for Phantom Ranch. The two other ways to get there are via a rafting trip or to hike from the rim. As I stood at the trail-head I was mesmerized by the sight of the winding trail that seemed to go into oblivion. I wanted to head down the trail on the spot, but I was there with Cindy, Bob, and Susan. In my mind I started planning a return trip, but the information on the trail-head sign was extremely discouraging. I had done the local Phoenix mountain trails at least a hundred times so I knew exactly what the numbers meant. From the south rim of the canyon to the river is a drop of about 4800 feet which is just short of one mile. The other sign (shown) said the path was 7.3 miles to Phantom Ranch (6.5 miles to the river) which would make the round trip over 13 miles. 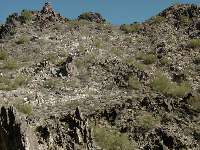 The local Phoenix trails of Piestewa Peak and Camelback Mountain are 1.25 miles with an altitude gain of 1250 feet. The canyon would be at least the equivalent of 4 of these. Just think of walking 13 miles! Then think that half of those miles are at 15% uphill grade. In my mind this was far worse than a marathon run which is 26 miles on relatively flat pavement. I had heard of various people doing the canyon hike, but all of them did it overnight. That means down the first day and up the next camping overnight or staying at Phantom Ranch. I read one account of a couple taking 6 hours to get to Phantom Ranch and taking 12 hours the next day to get out. The rule of thumb on these climbs is to figure it takes twice as long for the ascent. My personal experience on all my climbs echoes this simple formula. I would like to say I didn't want to get the necessary permits months in advance, but the truth is I simply wanted to do the canyon in a single day. Go down and then go right back out. Staying overnight had no appeal. Any documents you read about doing a canyon hike will strongly discourage you from attempting a one-day hike as many have been hospitalized and some have even died in the attempt. Because of my experience doing these kinds of hikes in the heat of Phoenix, I did not need to be convinced of the seriousness of these warnings. In fact, my first thought looking at the statistics made the endeavor seem impossible. I would have to train very hard to make this dream a reality. To make the climb even more difficult I wanted to go down and up the South Kaibab Trail. The other major trail is the Bright Angel. The South Kaibab Trail is much better from a scenic point of view. It is a rim trail whereas the Bright Angel is a ravine trail. The Bright Angel trail (which is nearly 9 miles, two and a half miles longer) follows a creek and has trees that supply shade. Another advantage of the Bright Angel Trail is there is drinking water available. There is absolutely no water on the South Kaibab Trail other than the water you carry with you. Consequently, the recommendation they make is go down the Kaibab and up the Bright Angel. Later that same summer I made my third trip to the canyon, this time with my brother Tim and his wife Diane. I cannot remember the reason, but Cindy did not join us on this trip. Tim and Diane were up to a small hike so we struck a simple deal. We would go for exactly one hour on the South Kaibab. Using the climbing rule of thumb, we would go down for twenty minutes and then turn around. But I would be well ahead of them setting my own pace. What I was really doing was testing how a future hike to the river would go. I went past a stop off point called Cedar Ridge and I calculated that I may have made it one third down the trail. If that was indeed the case, a total hike in the 3-4 hour time frame was possible. Cedar Ridge is a little under one fourth of the way and it is the recommended stopping point for anyone doing a single day hike. As I returned I thought about the altitude, but I couldn't definitively say the air was thinner than Phoenix. Less than a hundred feet from the top I rejoined Tim and Diane- the climbing rule of thumb working perfectly. It turned out to be four more years before I actually started training for a canyon hike. I had more time available as I was in business for myself and it wasn't very busy in first couple of years. I didn't actually do this with the canyon in mind since I just enjoyed doing Piestewa Peak (back in those days it was called Squaw Peak). And at this time I was playing tennis and the exercise was paying big dividends since I could play as long as I wanted without tiring. I was doing "laps" at Piestewa Peak which means going up and down more than once. Finally one Saturday I succeeded in doing four laps (4800 vertical feet, 10 miles) and my dream of doing the canyon was in reach. I trained through the winter months going to Piestewa Peak up to three times a week to prepare. But training in the winter is far easier than in the summer where doing even two laps can be challenging if it's in the middle of the day with a typical temperature of 105+ degrees. The temperature is very mild at the canyon rim due to the 7500 foot elevation, but at the bottom the temperatures can rival those in Phoenix. I wanted to get some training in during April where the weather can approach 100, but still be cool enough at the canyon to make the trip safer. Even though I was really training hard, I still had reason to be concerned. A Piestewa Peak climb goes up first. If you get tired there's no real problem. It's much easier going down as gravity is now your friend. The canyon descends first. Once you're in, you're committed. And it's a long long way down. Is four times really the equivalent? Going up and down is not quite the same thing. Another factor is the rim is at a high enough altitude that the oxygen content is less than Phoenix. 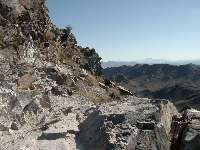 The top of Piestewa Peak is the altitude of the Colorado River at the bottom of the canyon. Having done only a third of the trail, it was an unfamiliar climb. But these paled in comparison to my biggest worry. Some climbing days were good, but others were not so good. Some days I seemed to have more energy than others. And it didn't seem to relate to how good I felt at the start of the climbs. What if on the day of my canyon climb I had a bad day? April 24, 1993 was the appointed day. My business partner, Guy, was taking me and his daughter. We left at 5:00 in the morning so I could be at the top of the trail by 10:00-10:30. We stopped in Flagstaff for breakfast where I ate well thinking it would be wise to fully fuel my body. I normally didn't hike with a backpack, but this time it would be necessary. I figured I should bring 2 quarts of water and I wanted to bring my camera to document what might well be a once in a lifetime experience. The weight of these items would have consequences later. As we parked the car and got a look at the canyon, I couldn't have picked a better day. The visibility was far better than my three previous trips. I told Guy I thought the trip would take anywhere from 3.5 to 4 hours. I really thought 3 hours was possible, but I thought more time was reasonable. He would take his daughter to the various lookout points and return by 2:30. I drank a lot of water and I felt great as I headed down the canyon. I trotted at times, but I mostly walked fast on the descent stopping here and there to take pictures and take sips of water. I was never thirsty, but I thought it would be good to keep fully hydrated. Besides, my two-quart canteen seemed heavy and drinking removed some of the weight. I will let the pictures describe the trail and the beautiful sights I saw during the hike. In words I can't do it justice. However, the beautiful pictures really don't do justice to the canyon's vastness. The hike can be divided into four sections. At the top the trail it descends rapidly as the trail switches back and forth very tightly. The rock is limestone which is fairly white and therefore so is the trail. But it doesn't last long and soon the rock turns red. I loved this part of the hike because I had been here before. It was familiar. At the left you can see a flat area known as Cedar Ridge. This is the recommended stopping point for anyone doing a day trip. After you pass this point, the number of hikers you encounter diminishes greatly. The next section is the longest. It descends at a very constant rate and the lengths of trail between switchbacks are very long at parts. The rock is very reddish and the trail dust gets on your shoes and into your socks as it is very fine. I was really having a good time at this point. I took several picture stops and admired the view. It must have been nearly an hour before I finally saw the muddy Colorado River which was my ultimate destination. As I looked back at where I started, it now seemed like such a long way. You could see the trail for a while, but then it would disappear in the distance. And every time I looked back, the length of the journey back seemed more insurmountable. 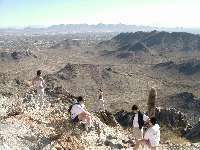 My training at Piestewa Peak, however, eased my mind since I'd done the equivalent of this hike several times before. At 1 hour and 25 minutes I was finally at the river. The last part of the trail is very steep so it has a lot of switchbacks and ends at a 50 foot tunnel which leads onto the bridge across the river. This was my stopping point because I was not heading to Phantom Ranch. I was excited to just be there. I took a couple of pictures and then mounted my 35mm camera to travel tripod in order to snap a couple of pictures of myself, proof to anyone I really made it! One of the pictures I succeeded in cutting off part of my head. As I packed up my camera preparing to go back up, I became very nervous. I could feel my heart beating as I was now thinking of the difficult (impossible?) task that lie before me. It was such a long way down and now I had to go back up. Furthermore, someone was waiting for me so if I was very behind schedule, they would be worried. I started up quickly in excitement. The trail which minutes before was an unknown was now at least familiar. Going up you really need to concentrate on your pace. It is not good to go too fast at the beginning because it can prematurely tire you. I was a little tired coming out of the steep bottom so I was relieved that I was now on more level ground for a while. But even here I was going a little too fast. Little by little I was tiring and the backpack was making my back sore. Even though I had tried to drink along the way my canteen was still 3/4 full! I continued to sip only here and there because I wasn't thirsty. I was now thinking of the weight of my water and camera. But I dared not empty any of my canteen. Having gone down the trail so quickly, a lot of it was unfamiliar as I made my way back. But the trail is so maintained, so obvious, there is absolutely no chance that you would accidentally lose it. The trail narrows to three feet at points, but on average it's over four feet in width. As my climb continued and as I tired I kept reassuring myself that Cedar Ridge was just around the corner. Once I'm there I should be able to make it out. But corners came and went and no Cedar Ridge. It didn't seem like this section was that long on the descent! I really wished during that time that I didn't have my backpack and the extra weight it contained. As I tired I completely lost the beauty of the canyon. My focus was looking forward to the top of the rim where my climb would finally end. It seemed like such a long way still to go. I was never worried, however. I was very fit and I knew I could do it. If I had to, I could rest for a while. But my thought was simple: keep moving. Finally, mercifully, I arrived back at Cedar Ridge where there were suddenly a lot of people. I stopped there for only a brief moment to look around and then continued the climb. The end was now in hand and no matter how tired I was, I knew I could make the remaining distance. What I remember of the rest of way was getting even more spent, simply putting one foot in front of the other and even having to stop for a few moments here and there. My mind was telling my legs to move, but they weren't cooperating. I felt totally exhausted. But I didn't feel sick! My thoughts at this time were back at Piestewa Peak where many times I was tired and I thought, "What if I were at the canyon and I got tired? I'd have to continue." What was silly was I still had more than half my water remaining and I should have dumped it. At this point on the trail so close to the end, there are plenty of people around and you are never alone. As I neared the end and looked to the top a very welcome sight was Guy and his daughter waiting for me. Guy immediately commented how tired I looked walking those last 100 yards. It took me 2 hours and 30 minutes to reach the top which was well ahead of the rule of thumb. The round trip had taken 3 hours and 55 minutes. As I got back to the car I wasn't really disappointed with the time even though I really thought I could have done it in 3.5 hours. That tired and exhausted, I was happy to have just made it. My dream of doing the canyon my way had been accomplished. As I removed my new red backpack that I had bought specifically for this trip, it permanently stained the back of my white shirt. My socks were full of red clay dust and would never again be white. I felt okay for a while and then made the mistake of drinking a coke. That upset my stomach and it took me an hour before I started feeling good again. I don't remember thinking I'll never do this again, but then again, I don't remember thinking I must try this again. How did I do the following days? Fairly well, but I was surprised that my legs were so sore since I thought I'd trained so well. Going back to Piestewa Peak was now a big challenge with summer now under way. It is difficult to do 3 or 4 laps if you're not climbing during the early morning. In the middle of the day I could do the first trip without water, but I'd need some for a second trip. If you're going to exercise in 100 degree plus temperatures exposed to direct sunlight (which is every day here in Phoenix during the summer), you better understand dehydration which can lead to heat exhaustion. You'd be surprised to find climbers in the heat of the day, but most of them are Piestewa Peak regulars. One afternoon when the temperature had reached 114 for several days in a row, one of the local stations had a reporter and photographer doing a story about the crazy people exercising in this dangerous heat. I wasn't interviewed, but had they I would said this wasn't responsible journalism. Showing this on TV might give people the idea it was okay to do this. There are different rules we observe when it's dangerously hot. When it's cool and crowded, you can pass many people without acknowledgment. But when there are very few because of the heat, you always acknowledge (say, "Hi," make eye contact) to everyone you pass. We check each other out to be sure everything's okay. When I see new people who are obviously not prepared, I ask them if they know the signs of dehydration and pending heat exhaustion, and invariably they don't know. If you're climbing in 100+ temperatures in direct sunlight, you are going to lose water very quickly. In fact, you have a hard time drinking enough to replenish what you are losing. Under these conditions, you should feel not just warm, but hot. You don't feel too bad at first but as time goes by you feel hotter and hotter, and it can get miserable. This is actually a good thing! If you continue long enough, almost magically you might start to feel good again. You might feel a little light headed and then you actually start feeling little cool. Not cold, but comfortable. Where did the heat go? I tell people this is your warning! It should never feel comfortable! If this happens, you start down immediately. Your body is starting to lose it's ability to cool down. The problem is if you haven't experienced it before and are not aware of what's really happening, you might think you've got you've got your "second wind" and continue on, exposing yourself to deadly heat exhaustion. Climbing in the middle of the day during the summer is somewhat demoralizing. Several weeks ago (before the canyon) I had no trouble doing 3 laps and could sometimes do 4. But now 2 was a challenge. It feels like you're suddenly out of shape! But then I would climb in the morning and suddenly 3 or 4 were possible which definitely lifts your spirit. The heat takes a lot from you. Your body wants to cool you down and one way it does that is to slow you down. By October when the weather was starting to cool my lap times came down. Guy wanted to take his boys to the canyon later in the month so I planned another canyon hike. This time I bought a water bottle belt and carried only 21 ounces of water (the amount of water I forced myself to drink the first time) and no camera. The trip was very much the same. We left at 4:30AM, eat breakfast in Flagstaff, and were at the canyon this time at 9:45. I had a lot of confidence this time since I felt I knew the trail. It was actually a bit cold at the rim, but there was no way I needed extra clothing. I would be warm enough in no time at all. I trotted down the trail sometimes breaking into a jog going a little faster than my first trip. It was surprising how many places on the trail that did not seem familiar, but for a lot of it, it seemed like I'd been there just yesterday. It wasn't nearly as clear as my April trip so I was glad I had my camera on that hike. In only 1 hour and 10 minutes I went through the tunnel and onto the bridge once again. What a difference. I had no concern whatsoever. I admired the sight for less than five minutes and then I started the trek back up. This time I was very mindful not to start too quickly because I felt this was my biggest mistake the time before. I set an even pace. The trip up was almost peaceful this time. I passed up several climbers on the way, but most of the time you had the trail to yourself. I continued to feel good and this time I wasn't hoping that Cedar Ridge was just around the corner. Suddenly, however, I was there! I checked my watch and it had only been 1 hour and 40 minutes. I made the rest of the hike in 25 minutes. I wasn't going for time- I just felt okay. I completed the ascent in 2 hours and 5 minutes for a round trip of 3 hours and 15 minutes! I wasn't tired at all this time. I could have gone a lot faster, but I felt I was quick enough. This time Guy was not waiting for me because I was ahead of schedule. I spent some time talking to an Austrian hiker who had also just completed the trip after staying overnight in the canyon. He hiked the Alps so he was well prepared for this climb. Guy came after about 15 minutes. The Austrian hiker needed a ride back to the top of the Bright Angel trail where he had started his hike (he did just the opposite of what they recommend), and we were glad to take him. I wrote this story only recently (early in 2002) and I hadn't been back to the canyon since that last hike, not even for a sightseeing tour at the rim. I haven't felt like I've been in good enough shape to do the kamikaze hike. But telling this story and going through the photos made me want to try it one more time. I started training at Piestewa Peak for an appointment with canyon on May 5th.